It's InFamous 2's single player that Sucker Punch is focusing on right now, but don't rule out playing the game with your friends. InFamous 2, the sequel to last year's super-powered, open-world, moral sandbox, may wind up with some kind of multiplayer by the time it launches in December. Desginer Darren Bridges said it was one of the features that Sucker Punch was thinking about adding to the game, along with Move support and 3D. Bridges said that Sony had a number of impressive technologies that it was looking in to, and that multiplayer was just one of them. 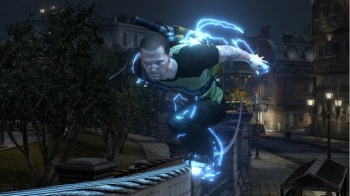 Multiplayer is by no means a certainty however, as he also said that the main focus was on the single player mode, and that once that was all wrapped up, Sucker Punch would see how other features would fit. InFamous 2's single player sounds like it is shaping up to be fairly similar to the first game's, with the morality system and side quests making a return. Bridges said that both of these features were big focuses for Sucker Punch, and admitted that some of the side quests in InFamous 1 hadn't quite been as good as they might have liked. The core of the InFamous games is player choice and how that affects the world around you, and while getting that same feeling in a multiplayer setting might be difficult, a co-op mode where several players roamed the city fighting - or committing - crime might be a lot of fun. Of course, Sucker Punch could go completely the other route and add rooftop lightning bolt death matches, and honestly, that could be a lot of fun too. InFamous 2 launches on PS3 at some point in 2011.